Guggenheim Helsinki Design Competition site view from Market Square. Courtesy Tuomas Uusheimo. 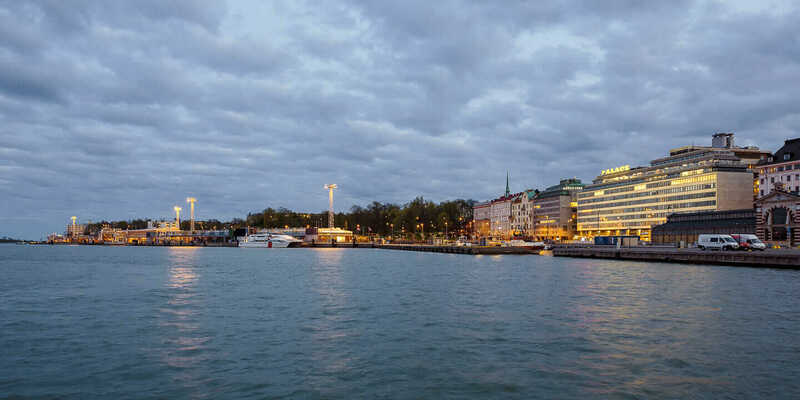 At first glance, Eteläsatama, or South Harbor in Helsinki, doesn’t stand out much from the ribbons of scenic shoreline that form the Finnish capital’s border with the sea. Ferries dock nearby, crowds meander over from nearby Market Square, and anyone strolling through can pause and snap a photo of famous cathedrals or the modernist Palace Hotel. But this 18,520-square-meter site can perhaps lay claim to a distinction no other site in the city—and the world—can. According to Troy Conrad Therrien, curator, Architecture and Digital Initiatives at the Solomon R. Guggenheim Foundation, it’s been the focus of more cumulative architectural effort than any plot of land in existence. “You could say that piece of soil on Helsinki harbor had more architectural intelligence invested in it than anything since the top of the mountain of the Parthenon,” he says. 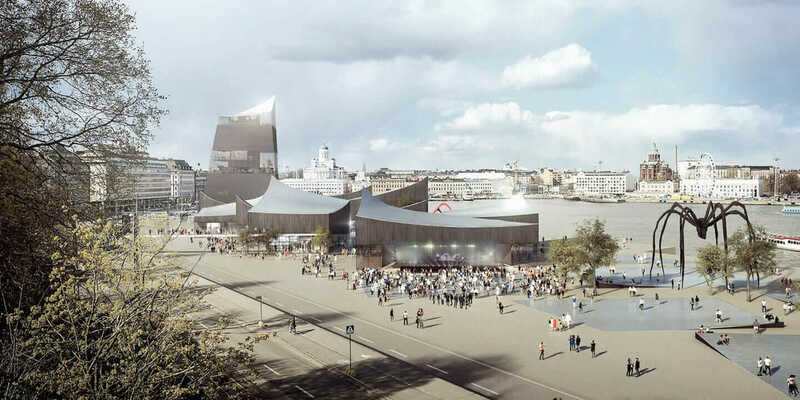 A hyperbolic assertion, certainly, but there hasn’t been much that’s been modest about the Guggenheim Helsinki Design Competition, which seeks to transform this waterfront plot into the foundation’s newest outpost. When the open competition for designs was announced on June 4, 2014, a robust competition was expected. 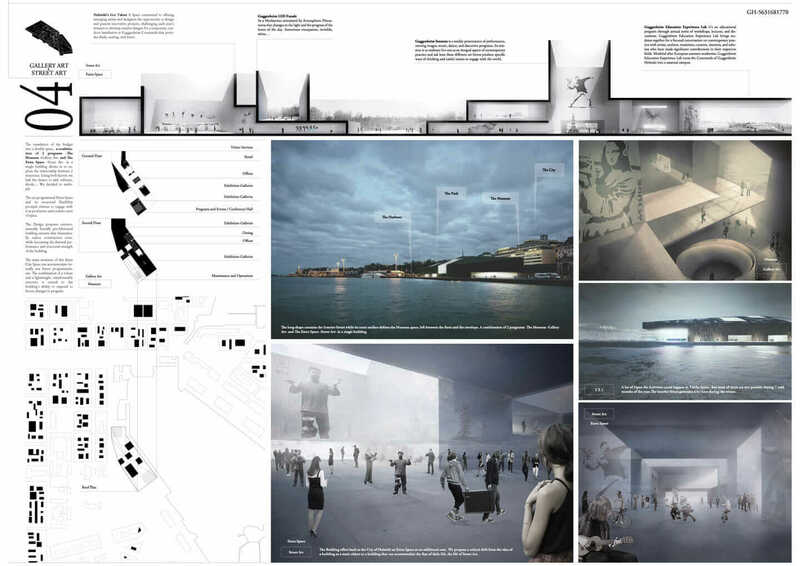 Guggenheim Helsinki Design Competition Competition finalist board. Courtesy Guggenheim. After 1,715 schemes from 77 countries arrived before the Stage One deadline in September, and were then posted online for the world to view (and sent to a jury to evaluate), it became clear this was something different. This may be the shape of architectural competitions to come, occurring at a nexus when communication is accelerating due to social media, design software makes entering more accessible and affordable, and global collaborations help cross-pollinate styles and ideas. Therrien sees the mass of entries for the Helsinki site as not only a time capsule of design now, and potentially the most valuable dataset of contemporary architecture, but also as the new normal. 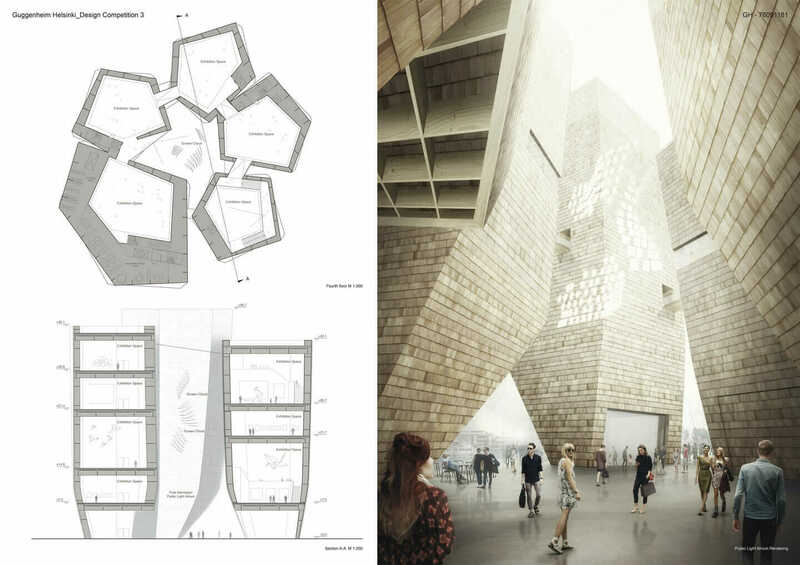 Guggenheim Helsinki Design Competition Competition finalist rendering. Courtesy Guggenheim. In many ways, the Guggenheim Helsinki Design Competition was a lightning rod before the first entry arrived. The call for submissions was the most democratic ever utilized by the Guggenheim Foundation, both a gesture to established Finnish and EU practices for architectural competitions, and perhaps a nod to tension with Helsinki after the city rejected the foundation’s original proposal. Many, including architect and critic Michael Sorkin, have questioned if this museum is the best use for the site, whether the single-building solution still dreams of the Bilbao effect and is imparting what Sorkin calls a “Starbucks bauble,” or a shiny-but-generic solution. 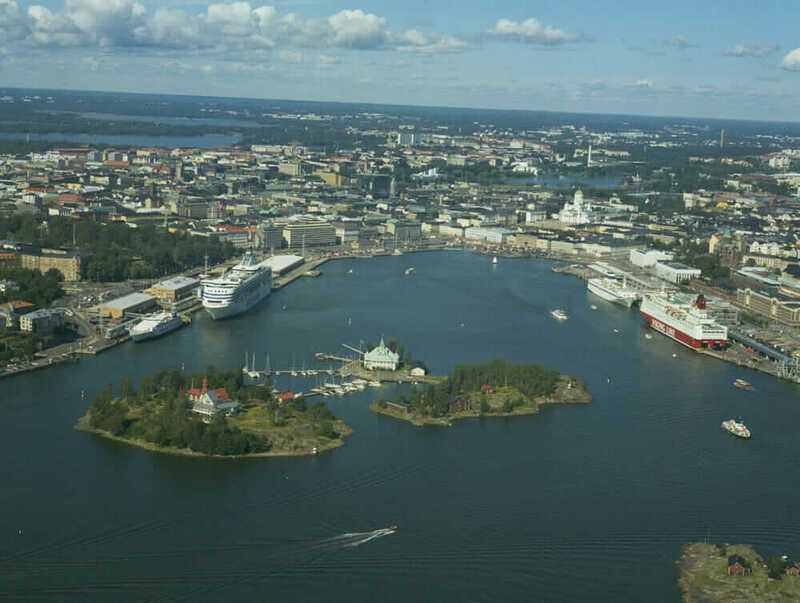 These beliefs have led Sorkin to help co-organize The Next Helsinki, a concurrent competition seeking alternative ideas for the harbor and the funding being directed at the site. While he feels there’s more than a touch of spectacle about the Guggenheim competition, there are aspects of the open-format concept he can support. While pointing out the exploitation that could come with spec work on a massive scale, Sorkin applauded this competition, and others like it, for dreaming of a winner beyond the starchitect faction. Europe is filled with hundreds of lesser-known public competitions that aren’t about one spectacular building, but ameliorating the quality of the public environment. And that often happens when the dark-horse submission wins. The Next Helsinki design competition site, behind the large passenger ship on the left. Courtesy Kaupunkimittausosasto. “The best thing is when someone who doesn’t have the inside track gets the job,” he says. Over the past few years, that’s been a more common result, according to Alexander Walter, editor in chief at Bustler, a site that aggregates and now organizes architectural and design competitions. A spin-off of Archinect (launched in 2008), Bustler has promoted or hosted thousands of competitions since then, and Walter has observed a trend toward the more open and democratized. What really excites Walter is the opening that more globalized, competitive, and accessible competitions leave for more diverse designs. He pointed to the recent Liget Budapest Gallery competition as a great example of how outreach, social media, and advertising can attract a diverse pool of participants. Currently, things are “run by the parametric discipline,” he says, but he hopes regional styles and a more international pool of participants can help broaden the architectural discourse. When Bustler looked at its Twitter audience, a significant portion came from areas outside the U.S. and Western Europe, such as Iran, Africa, and India. 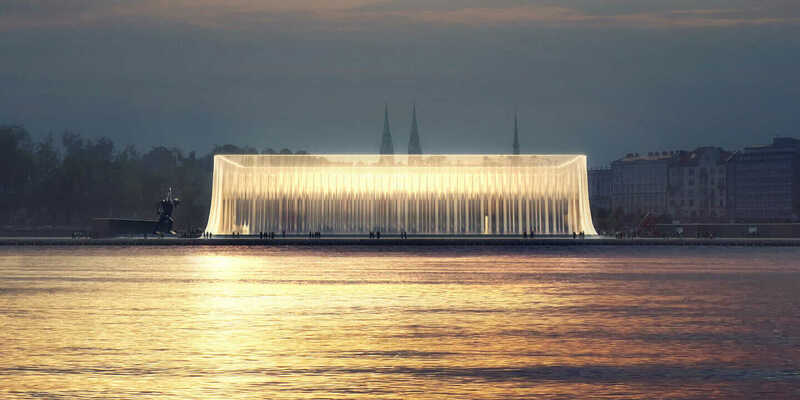 Guggenheim Helsinki Design Competition finalist rendering. Courtesy Guggenheim. As for this year’s Guggenheim Helsinki Design Competition, the six finalists selected by the jury have until April 2 to submit their final designs. And they probably won’t look much like the eccentric designs some commenters skewered on social media, such as the potato or sumo building.